Testimonials like this make us happy! Having worked with these State Department clients before, Gina and the Team were super excited to help them realize their dream of owning a acreage and a historical equestrian property in Middleburg. This would be their second property purchase, sight unseen, from across the globe. We love that we were able to service them again! “Gina and Company provided excellent service from start to finish. We could not have asked for a more seamless transaction. Her recommendations were sound and her team’s efficiency can be matched by none. Not even a 12 hour time difference could stand in the way of Gina and her team. I cannot say enough good things about this agent and highly highly recommend her and her team!! 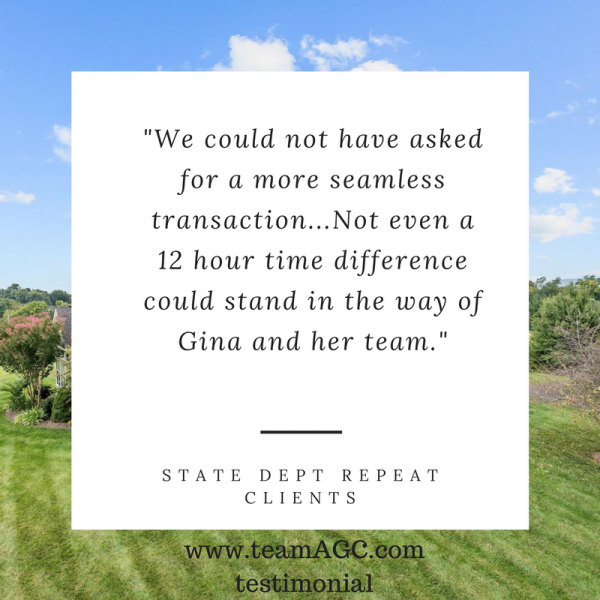 !” – testimonial from State Department repeat clients, AGC VIPs! At AGC we our goal is to provide stellar customer service utilizing our vast network and experience to deliver unparalleled results in the real estate industry. We want to hear your story and help write the happy ending!